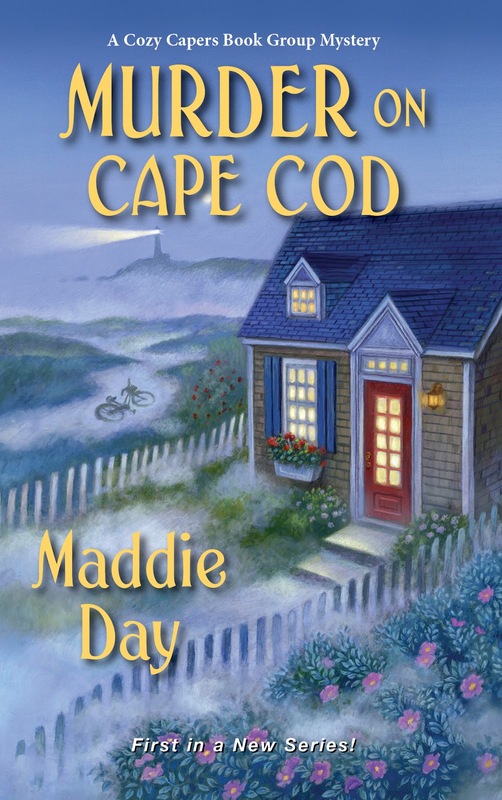 By Mac Almedia from Maddie Day's Murder on Cape Cod. Hey, everybody. I'm Mackenzie, but you can call me Mac. I'm so excited to tell you we finally have a December 18 release date for my new series - and it's a cozy mystery featuring a cozy mystery book group! That's right, the Cozy Capers read one cozy mystery a week. We meet and talk about the book, plus taste at least one of the recipes from it (if it doesn't include recipes, we make another food that's mentioned in the story). Things got complicated last June, though, when I literally tripped across a body on my way home from book group. It was a foggy Cape Cod evening and...well, here's what happened. Now I found the turn from the bike trail to the pathway that cut up to Main Street. Near the end of the path a hedge of scrubby coastal Rosa Rugosa separated the walkway from my postage stamp of a yard. The fragrant scent from the just-blooming native shrub mixed with the salt air and reminded me of my childhood here on the Cape. I slowed as I rounded a bend. I was scanning through the mist for the opening that would let me through the wall of roses when I tripped. The obstacle in my path, oddly both soft and solid, was a sizable one. I yelled, arms windmilling like in a vintage cartoon. The air gave me nothing to grab hold of and I landed on my hands and elbows. I glanced down and back to see my knees resting on…Jake. “Gah!” I shrieked and scrambled forward off of him. I crouched in place, my heart beating like the timpani in the Cape Symphony. Jake lay on his front with his head half-turned toward me, lips pulled back in a grimace, eyes unblinking. I'd been publicly arguing with Jake earlier in the day, and later my brother became a prime suspect. Everybody in the book group pitched in to try to find the killer before someone else in Westham became the victim. Readers: What's your favorite waterfront getaway? My author wants to give one of you an advance copy of the book, so be sure you leave your email address! 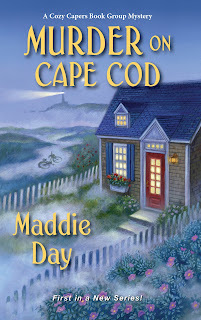 If you don't win, you can preorder it from Barnes & Noble - they have a print exclusive on Murder on Cape Cod for the first year, but if you're a Kindle user, you'll be able to buy it in 2020. Deciding on a favorite is very difficult as I love every coastal location I've ever been to, but I believe my all time most memorable was in Maui for all the beauty you can imagine! And I love Cape Cod beaches expecially like those with sand dunes plus they are close enough to drive to quite often. I would absolutely be honored to receive a copy to read and review. I love starting new series. Murder on Cape Cod looks like a fun read! Pudding Creek beach in Fort Bragg, CA. Appreciate the consideration! Entry shows me as unknown not sure why? Emerald Isle NC is my favorite. I just moved to Florida so exploring beaches will be next. Kitty Hawk N.C. That's where me and my ex had our honeymoon 30 years ago. It was definitely a gorgeous area at that time. Tangier Island on the Chesapeake Bay has a very nice, quiet beach. Very peaceful! Oh to live by the shore! I have been to Florida, but I would love to live in a small, coastal town. Being near the water, every day, would be my heaven! I am so excited for this new series to come out! I’m not a big water person but once in a while we’ll walk the boardwalk at the Jersey shore. Oh my goodness, another great book with such an amazing storyline. Can't wait to read more about Mackenzie “Mac” Almeida's adventures in Westham, Massachusetts. What fun it would be to be part of that Cozy Capers book club! LOVE the cover from the pretty flowers to the lighthouse in the background and the fog just lends itself to great mystery. My favorite waterfront getaway would be anywhere along the coast of Maine. Few years back we were able to take a bucket list trip to the New England states starting off by going up the entire coastline of Maine. We loved it all and it would be really hard to pick just one place. I guess if forced to pick just one place it would be around the Lubec area. While there we stayed at the old coast guard station - West Quoddy Station. Loved it and it was so peaceful and quiet and observing how much the tides went in and out was cool. Plus we were there during the eclipse and being out of town away from lights made it totally amazing to see. Thanks for the chance to win a copy of "Murder on Cape Cod" which is already on my TBR list! What a disappointment. 2020? Just slipped a notch on my favorite author list. Hope the B&N deal paid well. No thank you on the ARC. I can only do digital or large print. Don’t have a nook & don’t plan on getting one. Are libraries able to buy book from their jobbers or Overdrive? Linda, believe me when I say I hope this thing works out. When my agent said my editor had offered this exclusive, I said, "What about all my faithful kindle readers?" It's an experiment, and I hope my fans will be patient. Please write to me at edith@edithmaxwell.com. I have an idea. Thanks, Robin. I post here on the 3rd of every month. And I'm delighted you love my other series! Oh yay, a new series, it sounds good. I want to be part of that book group. My favorite waterfront these days is the back yard next to the pond. Still love the ocean beaches anywhere in California. Awesome writer. Hard to wait for the next book! I will remind you - you can be sure of that, Kay, LOL! Congratulations, Tracy! Random.org picked you. Please check your email. Sounds like a great new series. My favorite waterway getaway is Mackinac Island MI on Lake Huron. I'm only about 30 minutes away from Carmel-by-the-sea on Californias Central Coast. Love it there. I make an annual visit to Ocean Shores, WA. For me, nothing is as relaxing as listening to the ocean. �� Thanks for this opportunity! HawksSB48 (at) gmail (dot) com. I think I'll go with North Beach on Oahu. Looking forward to this series, Edith! 2020 is a LONG time to wait for kindle! Hope I can get it much sooner...like an ARC?!!! My favorite place to walk along the water is Beaufort, NC. It's beautiful and quiet, with little shops and restaurants to visit. I love the cover of this book and can't wait to read it! I'm rather fond of Cape Cod myself but I've only been once when I was 15. I do still have relatives on the cape. Since I live in the midwest & in the state of Minnesota, I'm going to go with the Mississippi River. I live just a quarter of a mile from the high bluffs that has a wonderful walking path over looking the river. It's so peaceful and beautiful to walk along the river. Growing up I lived in Chicago and loved Lake Michigan. Water is very healing and calming to me. San Francisco. Love the wharf!! I don't have a favorite. Too far inland. I like cities on the river, and the beautiful riverfronts and lights at night. I have to say Panama City Beach, AKA the Redneck Riviera. Met my husband there & we got married right on the beach. Thanks to everyone for your enthusiastic comments! And congratulations to Tracy Shafer, random.org's pick. I wish I had a copy for everyone. Tracy, please check your email.